Slowly slowly I have built up a portfolio on Gigapan, from MSL to the Dawn Spacecraft around 10 - 11 months on there's around 490 Gigapans' (of ok quality.. I think... ? lol) up there for people to enjoy mooching over. I recently started a Flickr account and started to add my work on there so everyone can download my finished images and do what they want with - I'm more than glad at the responses and encouragement I have had over the last 10 - 11 months, and even trolls aside get a lot of enjoyment from searching / processing and sharing these images. I was very humbled when Keith asked my opinion on some of his work in progress, I felt as though I really shouldn't have my opinion asked - being a newbie / and not qualified in any field of science or photography, I kinda felt out of place -- I still don't see myself as anything other than a newcomer to the world of space and image processing / much like Pandora's box, once opened its an exponential ride of learning / endless reading / processing! I am Clay,a Canuck north of USA, Our city(Regina) was named after Victoria. @ work- I move people's possessions. The crust that encases rocky planets and makes possible the emergence of life took shape on Mars earlier than thought and at least 100 million years sooner than on Earth, researchers said Wednesday. A trio of researchers with ETH Zurich and the University of Chicago has found evidence that suggests narrow channel networks seen on the surface of Mars are due to heavy rainfall runoff. 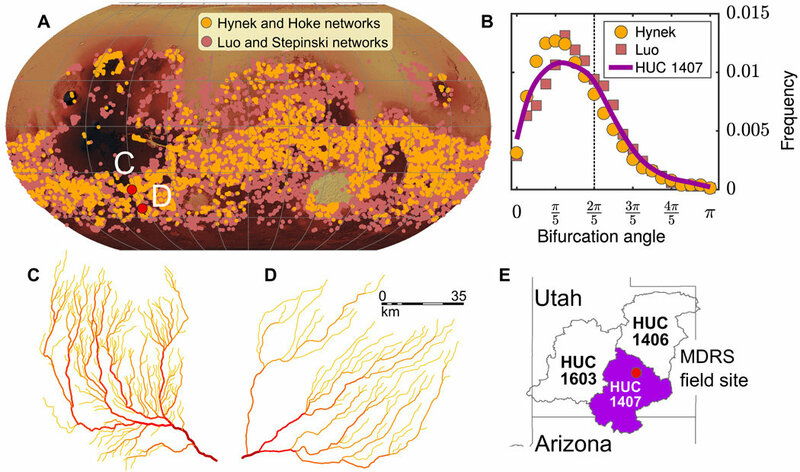 In their paper published on the open access site Science Advances, Hansjoerg Seybold, Edwin Kite and James Kirchner describe their study of the channel networks and comparisons they made with similar formations found here on Earth. Also THANK YOU for getting the knowledge and work in putting together Gigapans. Take a look at that rock with a "note-card" off to the left of the rover that had STOPPED right at this point after a Long Auto-Drive. Here is the email response I got in FULL. I have not had ANY other response despite several attempts. Here is some info from one of the MSL folks. Hope this provides some insight. Unfortunately, we aren't sure, from our perspective, what this could be. their R-eye counterparts so it's real, whatever it is. I don't see any mastcam imaging of it. at ~line 281 samp 191 but it's seen from the other side, the "card"
at ~line 276 samp 776. But also, no Mastcam. that it fades from view as we drive away. it looks like there is no Mastcam coverage. comments: https://pds-imaging.jpl.nasa.gov/data/ms.../SOL01669/ loook at any of the 3D or 2D black and white images you'll see a rock close to the rover with a WHITE SQUARE 'CARD' attached to it. No ZOOM image, No color image. In fact in subsequent sols Rover moves from this site 62 to 63 so the note CANNOT be seen anymore. It cannot be hidden anymore, where are the COLOR 3D ??? Mickey Malin doing another 1998 'Catbox"? So Neil as a "new" master of doing Mars and Lunar imaging Gigapans and scanning for Anonymously items that NASA/JPL and ESPECIALLY ANY thing to do with Dr Mikey Malin Camera or his MSSS "team" since 1998 what should we do next with the #2020CydoniaRover ??? Again Welcome to the forum, I look forward to ANY help in learning more image processing myself. Your "note card" is interesting indeed, and I know what it probably is, geologically. I am surprised at the extent of the response you got in the email. They certainly tried to help. and likely for other people as well. The second link in particular would be nice to see an image of. Thanks for the warm welcome folks, And not just a warm welcome of 3 syllables and a smiley face - Some proper "meat on the bones" welcomes! I can't thank you enough! The internal debate with myself as to "what I'm Seeing" usually ends up with me not being sure enough to start posting images and stating "X,Y & Z"
The guys over on whatsupinthesky.com forum made me realise with their short and to the point answers, no faff no waffle, just an honest reply..
Quote: So Neal as a "new" master of doing Mars and Lunar imaging Gigapans and scanning for Anonymously items that NASA/JPL and ESPECIALLY ANY thing to do with Dr Mikey Malin Camera or his MSSS "team" since 1998 what should we do next with the #2020CydoniaRover ??? Now these are the guys setting the 'Bar' with regards to quality and clarity, and really can say they are Masters. There are MANY other FREE imaging software the PDS has for Downloading looking into ALL kinds of data the PDS keeps and is REQUIRED to keep. ALL DATA...and I DO MEAN ALL...BY LAW...to the PDS within SIX (6) months of their acquisition !!! But she DID make Tricky Mickey and MSSS release over 76,000 images he was with-holding for more than 26 MONTHS !!! The SAME still holds true for HiRise, UnCurious-Curiosity and the New Horizens Fly Bye Bye, Ceres Dawn, the list goes on n on n on. Nice to see that you are enjoying being here Terraform Mars. still adhering to the side of the broken up strata block. You can see white lines in the flat surface just in front of the rover. when the strata was buried and partially broken or buckled from stress fracturing. which did not succumb to erosional processes after the strata was exposed above surface. It is an exceptional example. if you just took the time to copy the image, and just post the actual image that was linked. People aren't going to take the time to process the NASA method to open the images. that geologic description I posted of Bob's "notecard"
but was not NASA planetary geology trained. though it does have some distinct precedence with Earth examples. You can still see a tiny knob of the dark material still adhering on the face front of the white material. :) who do you think pointed Todd and Will and them towards MultiSpec Neal? I learned long ago, anyone can look at and work with the browse data.. It takes a hero to learn to use the real satellite imagery. Welcome to The Hidden Mission Neal. May your insights be deep, your analysis clean and your sharing honest. Welcome Neal ! So Keith, we all have you to thank for the info too - This Is one thing I liked about WUITS.com and Here - Open and honest; much like the Linux Community, opensource/openshares attitude, we all learn more together I was told on many occasion while I was learning how to root / slim down / compile some android stuff a years ago. It was a really really good melting pot of ideas on some of the Irc messenger / group chats etc.. I still feel bad about shameless self promoting - I commented on a couple of Videos "Mars Anomalies & Beyond" (YouTube) Had done, that actually used my own Gigapan(s) and didnt want to start shamelessly spouting off about talent I aint' got. I'm hoping it's actually done some good, I decided I'm here for the long run, not a 3 month fad -- Between a core of space resources, documentaries, lectures, images and research I have sat and done just on background I know it's now not a fad, more an obsession! 40 mins gone, right less talking **** Mr Neal & get some work done!